What do you get when you take a batch of incredible songs, five veteran players who have never played together, with an arsenal of five musical minds working in unison to reinvent them? You get Hard Working Americans. Genres meld seamlessly with the birth of this group, featuring artists from the Americana, singer/songwriter, experimental, jam and rock communities. 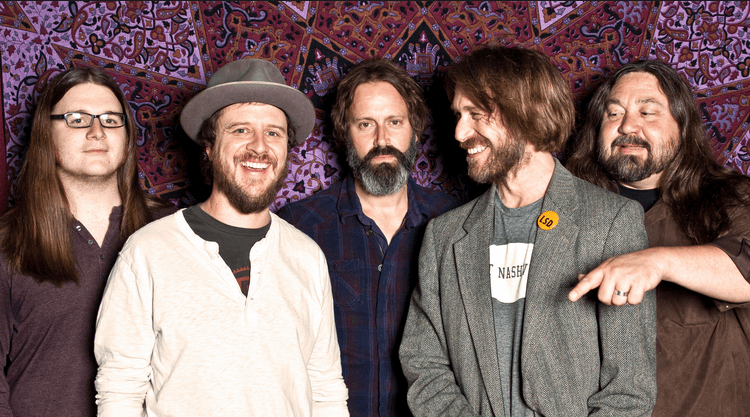 The band released their anticipated self-titled album today, which features Todd Snider, Dave Schools of Widespread Panic , Neal Casal of The Chris Robinson Brotherhood, Chad Staehly of Great American Taxi, and Duane Trucks of Col. Bruce Hampton’s school of music. Alex May talked with keyboardist Chad Staehly about the new band’s formation, creative process, and what fans can expect in 2014. Can you tell us a little about your new release (Hard Working Americans, out today on Melvin Records)? Yea sure, this is a brand new band, and this is gonna be the first album that’s coming out on Tuesday January 21st. it’s already been released to radio for a couple weeks and has been received really well there. We’re excited about the album. We recorded it back in May at TRI Studios out in San Rafael, California, which is Bob Weir of the Grateful Dead’s recording studio/performance studio. We had a great experience there, spent about ten days and made the album pretty much in one shot, and we’re really excited with the results we got. There’s a video out right now for the song Stomp and Holler, and we’re about to release a video for the song Down to the Well. Then there’s talk of some more video stuff. It seems like that’s kind of the way people find music these days is on the internet and Youtube, so we’re trying to get with the times and create some video content to accompany some of the songs. Hard Working Americas consists of members from other bands in the jam band scene. Can you tell us how you all came together? Todd Snider had played a gig last year with David Schools from Widespread Panic and it was for one of Todd’s shows in Napa, California. Those guys just had such a good time playing together, they hadn’t hung out or played any music in quite a few years, so it was a good reconnection for them. They had so much fun, they decided that they wanted to do a project. Todd called me to help them pull it together. We just started picking out some of the people that we would really like to play with, Neil Casal was a guitar player that was on the top of the list, and Duane Trucks was recommended by Dave to play drums, and both those guys were available and wanted to do it, so we all got together for the record. Some of us hadn’t even ever met before, so it was interesting to see it come together so quickly, and gel musically. Everything worked out great, and we really kind of got the people we were hoping to get on the project. That was mostly Todd. I think it was one of these names or titles that Todd had kind of been keeping in his back pocket. The last couple of Todd Snider’s solo records, Agnostic Hymns & Stoner Fables, the Excitement Plan, there are a few others, they have kind of been dealing with you know, regular everyday kind of folk, you know, everyday people, blue collar people and kind of writing about them. So Todd had this idea that we call the band Hard Working Americans, but kind of take it from a different slant, that it’s not just one certain type of person that’s a patriot, or a hard working American. A hippie can be a hard working American, a musician is definitely a hard working American, so it was kind of to take this concept and turn it on its head and take it back for the freaks who want to wave a flag, too. You touched on similar topics of the working class and the american dream, in your other band, Great American Taxi, how has that helped you in Hard Working Americans? It’s interesting, Todd and I have worked together. Taxi backed up Todd on some albums and done some touring with him, and then Todd helped Taxi produce an album, our last album. Those topics seem to come up with Great American Taxi as well. I guess it’s because of this multinational corporation kind of world takeover that’s happening, and some of us see it. I think a lot of people see it, maybe it’s just not being talked about enough. As musicians and as writers, we just feel like it’s a subject that really needs to be tackled, and more attention needs to be drawn to it. Without being overly political or jamming anything down anyone’s throats. First and foremost, us being out there and touring and playing music, it’s really about kind of escaping from all that and just having a good time, and I think that’s number one. Our political party is let’s get together and all have a good time, and take care of each other and not hurt anyone. Your new album consists of covers of songs that are arranged in a way to tell a message. How did you go about choosing which songs to include? Todd was kind of the leader of that, Todd, Dave, and myself bouncing around about 25 to 30 songs, most of which Todd had picked out or had been collecting from some of his friends who are songwriters around east Nashville and beyond, and then after we started bouncing around this list of about 25 or 30 songs, we kind of whittled that down to about 15, and then I think that got whittled down further to like 12 or 13 that we actually cut, and then 11 of them made it on to the record. The term “covers” kind of throws me for a loop, and I don’t know if it’s the right description of what we did. First of all, with Todd being based in Nashville, people there are always recording other people’s songs, that’s just kind of the way that world works. If there’s good songs floating around, why not record them? So you know there was that, and then there was also this idea that that’s kind of where a lot of the great bands started, too, the Beatles and the Rolling Stones, even the Grateful Dead on their first record had some traditional songs and a couple of covers. You know, I think it took some pressure off the project, but also these were just songs that Todd had been collecting for a lot of years, and felt he’d find a project to do it with, and it just so happens that this was the project that seemed appropriate to pull these songs together and record. And there was a theme to them you know, and that kind of fit in with the name of the band, Hard Working Americans, and there was a story to be told. Todd usually when he writes his own albums, there’s usually a script in play, a thread that ties all the songs together and what Todd felt this cycle of songs was going to do would tell the story of maybe kind of a independent thinking, maybe a hippie type person that grew up and was into music and into traveling around the country experiencing life that way, and then maybe kind of settled down and some other things started to happen, and then they kind of arrived back at that place where they started. The song that we cut that’s at the end of the record, Wrecking Ball, kind of seemed to sum it all up and tie it all together, so it’s really cool how that worked out, to kind of be the end cap of the album. How did you approach interpreting the songs in your own way? We didn’t know how that was gonna work out when we arrived at the studio, and we had all kind of heard the songs that we were gonna focus in on, and that’s where I think the term “covers” is maybe not the right term, too, because I feel like when a band covers a song, so to speak, they’re trying to play it note for note, and kind of reinterpret it the same way the original recording artist did, or performing artist did. Todd’s got this great sense, for one, being such a great songwriter, he really understands lyrics and poetry. If a song strikes him, it’s because he can really relate to it. So he kind of was already there with the songs, and was able to give them his own spin, and he’s always been really good at that. So what he did was, he would start singing the melody in a feel where he felt it should be, and kind of stomping his feet, or tapping something, sometimes he’d have a guitar, mainly it was just a tempo thing and he’d start singing, and we’d find the key he was singing in, and we started building the arrangement and the progression behind that. It was really interesting. It started with the first song we started recording, and it continued through the whole session where Todd would kind of stomp out the song and start singing it with a feel, and then the band would kind of start dropping in behind him, and a few takes later we’d kind of have the arrangement worked out and sounding like our own song. It was really amazing how it all turned out, and it was just this natural thing that we kind of fell into. It was very organic and seemed to work like I said from song one, and kind of continued that way through the whole session. What are some of your goals in 2014? It’s gonna be tough to tour a lot, just with everyone being involved in other projects. We’re all focused on this, and we want this to be a band, and want it to do more than just this first tour and this first album. We’re working on carving out some chunks of time to play some more shows this year, and then already right after the last show of this tour which is in Chicago in February, we’re going to go right into the studio after that last show and start working on a new album which it’s going to be all stuff that Todd and the band have written together. Thanks again to Chad Staehly for taking the time to talk with us! Don’t miss Hard Working Americans at the State Theatre, Sunday January 26th!